Does this mean you have to resign yourself to a home filled with shabby furnishings? 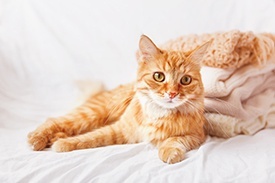 We've discovered some helpful tips for selecting fabrics that are compatible with both your lifestyle and your precious pet. Patterns. Pet hair, dirt and stains can stand out like a sore thumb on solid fabrics. Patterns make good camouflage, especially if one of the main colors is close to the shade of your pet's hair. Synthetic Fibers. Ultrasuede and microfibers hold up well to pet activity, even scratching, and they can often be cleaned easily with soap and water. Leather. This may not seem like an obvious choice, but cats will generally avoid leather as long as they have other options, like scratching posts. Leather is also odor-resistant and doesn't attract pet hair. If you still have doubts, distressed leather is a stylish choice that hides scuffs and scratches. Crypton. No, not THAT Krypton, but it is considered a "super" fabric. In 1993, husband-and-wife team Craig and Randy Rubin created Crypton precisely because they wanted an eco-friendly fabric that would "stand up to life's messes." Crypton is stain-, odor- and microbe-resistant, but so soft and lovely that it's used for pet beds and kids' car seats. Scotchgard and Slipcovers. If you already have furniture you like when you bring your pet home, you don't have to start all over. A coat of Scotchgard is effective against water and stains, or you can express your personality with a DIY slipcover. Tweed. It may seem like a durable fabric, but its nubby texture traps hair, making it difficult to clean. Chenille. Like tweed, chenille is a deceptive choice. The loopy pile hides a multitude of sins, but it can unravel quickly with just the slightest snag from a pet claw. Velvet and Silk. Velvet is actually fairly sturdy, but stains are almost impossible to remove and rambunctious pets could permanently damage the pile. Silk is fragile and notoriously difficult to clean. Do you have an imaginative tip for making our Springs Apartments homes more pet-friendly? Tell us in the comments!